Compositions for treating fabric articles, especially articles of clothing, linens and drapery, wherein the compositions provide improved cleaning of soils from and/or care of and/or treatment of fabric articles, especially while providing superior garment care for articles sensitive to water as compared to conventional fabric article treating compositions, are provided. This application is a continuation of and claims priority under 35 U.S.C. §120 to U.S. patent application Ser. No. 11/474,607, filed Jun. 26, 2006, which is turn is a continuation of co-pending U.S. patent application Ser. No. 11/116,787, filed on Apr. 28, 2005, now issued as U.S. Pat. No. 7,101,835, which is a continuation of U.S. patent application Ser. No. 10/177,691, filed on Jun. 21, 2002, now issued as U.S. Pat. No. 6,894,014, which claims priority to U.S. Provisional Application Ser. No. 60/300,116 filed on Jun. 22, 2001; and which is a continuation-in-part of U.S. patent application Ser. No. 09/849,843, filed on May 4, 2001, now issued as U.S. Pat. No. 6,939,837, which claims priority under 35 USC 119(e) to U.S. Provisional Application Ser. No. 60/209,250 filed on Jun. 5, 2000. The present invention relates to compositions for treating fabric articles, especially articles of clothing, linens and drapery, wherein the compositions provide improved cleaning of soils from and/or care of and/or treatment of fabric articles, especially while providing superior garment care for articles sensitive to water as compared to conventional fabric article treating compositions. For the cleaning of fabric articles consumers currently have the choice of conventional laundry cleaning or dry cleaning. Conventional laundry cleaning is carried out with relatively large amounts of water, typically in a washing machine at the consumer's home, or in a dedicated place such as a coin laundry. Although washing machines and laundry detergents have become quite sophisticated, the conventional laundry process still exposes the fabric articles to a risk of dye transfer and shrinkage. Significant portions of fabric articles used by consumers are not suitable for cleaning in a conventional laundry process. Even fabric articles that are considered “washing machine safe” frequently come out of the laundry process badly wrinkled and require ironing. Dry cleaning processes rely on non-aqueous solvents for cleaning. By avoiding water these processes minimize the risk of shrinkage and wrinkling; however, cleaning of soils, particularly water-based and alcohol-based soils, is very limited with these processes. Typically, the dry-cleaner removes such soils by hand prior to the dry-cleaning process. These methods are complex, requiring a wide range of compositions to address the variety of stains encountered, very labor intensive and often result in some localized damage to the treated article. Accordingly there is an unmet need, in commercial laundry, in dry-cleaning and in the home, for fabric article treating compositions, which simultaneously provide acceptable cleaning of across a variety of soils while remaining safe for a wide range of fabric articles. The present invention provides compositions which exhibit improved cleaning of soils from and/or care of and/or treatment of fabric articles. These benefits may be delivered to the fabric article treated by the compositions of the present invention while maintaining excellent fabric care properties. c) from about 2% to about 40% by weight of the composition of a polar solvent comprising 1,2-hexanediol. e) optionally, from about 0.01% to about 10% by weight of the fabric article treating composition of other cleaning adjuncts. In another aspect of the present invention, a consumable detergent composition is provided such that upon dilution (i.e., mixing) with decamethylcyclopentasiloxane, the aforementioned fabric article treating compositions are achieved. In another aspect of the present invention, methods for treating fabric articles in need of treatment are provided. c) optionally, subsequently agitating the fabric articles. Steps a) and b) can occur in any sequence and/or concurrently. These and other aspects, features and advantages will become apparent to those of ordinary skill in the art from a reading of the following detailed description and the appended claims. All percentages, ratios and proportions herein are by weight, unless otherwise specified. All temperatures are in degrees Celsius (° C.) unless otherwise specified. All measurements are in SI units unless otherwise specified. All documents cited are, in relevant part, incorporated herein by reference. The term “fabric article” used herein is intended to mean any article that is customarily cleaned in a conventional laundry process or in a dry cleaning process. As such, the term encompasses articles of clothing, linens, drapery, and clothing accessories. The term also encompasses other items made in whole or in part of fabric, such as tote bags, furniture covers, tarpaulins and the like. The term “lipophilic fluid” used herein is intended to mean any nonaqueous fluid capable of removing sebum, as described in more detail herein below. The term “fabric article treating composition” used herein is intended to mean any lipophilic fluid-containing composition containing cleaning and/or care additives that come into direct contact with fabric articles to be cleaned. It should be understood that the term “fabric article treating composition” encompasses uses other than cleaning, such as conditioning and sizing. Furthermore, optional cleaning adjuncts such as additional surfactants other than those surfactants described above, bleaches, and the like may be added to the “fabric article treating composition”. That is, cleaning adjuncts may be optionally combined with the lipophilic fluid. These optional cleaning adjuncts are described in more detail hereinbelow. Such cleaning adjuncts may be present in the fabric article treating compositions of the present invention at a level of from about 0.01% to about 10% by weight of the fabric article treating composition. The term “soil” means any undesirable substance on a fabric article that is desired to be removed. By the terms “water-based” or “hydrophilic” soils is meant that the soil comprised water at the time it first came in contact with the fabric article, or the soil retains a significant portion of water on the fabric article. Examples of water-based soils include, but are not limited to, beverages, many food soils, water soluble dyes, bodily fluids such as sweat, urine or blood, outdoor soils such as grass stains and mud. The term “capable of suspending water in a lipophilic fluid” means that a material is able to suspend, solvate and/or emulsify water, in a way that the water remains visibly suspended, solvated or emulsified when left undisturbed for a period of at least five minutes after initial mixing of the components. In some examples of compositions in accordance with the present invention, the compositions may be colloidal in nature and/or appear milky. In other examples of compositions in accordance with the present invention, the compositions may be transparent. The term “insoluble in a lipophilic fluid” means that when added to a lipophilic fluid, a material physically separates from the lipophilic fluid (i.e. settle-out, flocculate, float) within 5 minutes after addition, whereas a material that is “soluble in a lipophilic fluid” does not physically separate from the lipophilic fluid within 5 minutes after addition. The term “consumable detergent composition” means any detersive composition, that when combined with a discrete lipophilic fluid, results in a fabric article treating composition according to the present invention. The term “processing aid” refers to any material that renders the consumable detergent composition more suitable for formulation, stability, and/or dilution with a lipophilic fluid to form a fabric article treating composition in accordance with the present invention. The term “mixing” as used herein means combining two or more materials (i.e., more specifically a discrete lipophilic fluid and a detergent composition in accordance with the present invention) in such a way that a homogeneous mixture or stable dispersion or suspension is formed. Suitable mixing processes are known in the art. Nonlimiting examples of suitable mixing processes include vortex mixing processes and static mixing processes. The present invention provides compositions which exhibit improved cleaning of soils (i.e., removal and/or reduction of soils) from and/or care of and/or treatment of fabric articles. These benefits may be delivered to the fabric article treated by the compositions of the present invention while maintaining excellent fabric care properties. Moreover, suitable lipophilic fluids herein are readily flowable and non-viscous. Other suitable lipophilic fluids include, but are not limited to, organosilicone solvents including both cyclic and acyclic types, and the like, and mixtures thereof. Any nonaqueous fluid that is both capable of meeting known requirements for a dry-cleaning fluid (e.g., flash point etc.) and is capable of at least partially dissolving sebum, as indicated by the test method described below, is suitable as a lipophilic fluid herein. As a general guideline, perfluorobutylamine (Fluorinert FC-43®) on its own (with or without adjuncts) is a reference material which by definition is unsuitable as a lipophilic fluid for use herein (it is essentially a nonsolvent) while cyclopentasiloxanes have suitable sebum-dissolving properties and dissolves sebum. The following is the method for investigating and qualifying other materials, e.g., other low-viscosity, free-flowing silicones, for use as the lipophilic fluid. The method uses commercially available Crisco® canola oil, oleic acid (95% pure, available from Sigma Aldrich Co.) and squalene (99% pure, available from J. T. Baker) as model soils for sebum. The test materials should be substantially anhydrous and free from any added adjuncts, or other materials during evaluation. The level of lipophilic fluid, when present in the fabric article treating compositions according to the present invention, is preferably from about 70% to about 99.99%, more preferably from about 90% to about 99.9%, and even more preferably from about 95% to about 99.8% by weight of the fabric article treating composition. The level of lipophilic fluid, when present in the consumable detergent compositions according to the present invention, is preferably from about 0.1% to about 90%, more preferably from about 0.5% to about 75%, and even more preferably from about 1% to about 50% by weight of the consumable detergent composition. The surfactant component of the present invention can be a material that is capable of suspending water in a lipophilic fluid and/or enhancing soil removal benefits of a lipophilic fluid. The materials may be soluble in the lipophilic fluid. One class of materials can include siloxane-based surfactants (siloxane-based materials). The siloxane-based surfactants in this application may be siloxane polymers for other applications. The siloxane-based surfactants typically have a weight average molecular weight from 500 to 20,000. Such materials, derived from poly(dimethylsiloxane), are well known in the art. In the present invention, not all such siloxane-based surfactants are suitable, because they do not provide improved cleaning of soils compared to the level of cleaning provided by the lipophilic fluid itself. D″ is R6 2SiO2/2 wherein R6 is independently H, a monovalent hydrocarbon group or (CH2)1(C6H4)m(A)n—[(L)O-(A′)p-]q-(L′)rZ(G)s, wherein 1 is 1-10; m is 0 or 1; n is 0-5; o is 0-3; p is 0 or 1; q is 0-10; r is 0-3; s is 0-3;C6H4 is unsubstituted or substituted with a C1-10 alkyl or alkenyl; A and A′ are each independently a linking moiety representing an ester, a keto, an ether, a thio, an amido, an amino, a C1-4 fluoroalkyl, a C1-4 fluoroalkenyl, a branched or straight chained polyalkylene oxide, a phosphate, a sulfonyl, a sulfate, an ammonium, and mixtures thereof; L and L′ are each independently a C1-30 straight chained or branched alkyl or alkenyl or an aryl which is unsubstituted or substituted; Z is a hydrogen, carboxylic acid, a hydroxy, a phosphato, a phosphate ester, a sulfonyl, a sulfonate, a sulfate, a branched or straight-chained polyalkylene oxide, a nitryl, a glyceryl, an aryl unsubstituted or substituted with a C1-30 alkyl or alkenyl, a carbohydrate unsubstituted or substituted with a C1-10 alkyl or alkenyl or an ammonium; G is an anion or cation such as H+, Na+, Li+, K+, NH4 +, Ca+2, Mg+2, Cl−, Br−, I−, mesylate or tosylate. Examples of the types of siloxane-based surfactants described herein above may be found in EP-1,043,443A1, EP-1,041,189 and WO-01/34,706 (all to GE Silicones) and U.S. Pat. No. 5,676,705, U.S. Pat. No. 5,683,977, U.S. Pat. No. 5,683,473, and EP-1,092,803A1 (all to Lever Brothers). Nonlimiting commercially available examples of suitable siloxane-based surfactants are TSF 4446 (ex. General Electric Silicones), XS69-B5476 (ex. General Electric Silicones); Jenamine HSX (ex. DelCon) and Y12147 (ex. OSi Specialties). A second preferred class of materials suitable for the surfactant component is organic in nature. Preferred materials are organosulfosuccinate surfactants, with carbon chains of from about 6 to about 20 carbon atoms. Most preferred are organosulfosuccinates containing dialkly chains, each with carbon chains of from about 6 to about 20 carbon atoms. Also preferred are chains containing aryl or alkyl aryl, substituted or unsubstituted, branched or linear, saturated or unsaturated groups. Nonlimiting commercially available examples of suitable organosulfosuccinate surfactants are available under the trade names of Aerosol® OT and Aerosol® TR-70 (ex. Cytec). The surfactant component, when present in the consumable detergent compositions of the present invention, preferably comprises from about 1% to about 99%, more preferably 2% to about 75%, even more preferably from about 5% to about 60% by weight of the consumable detergent composition. The non-silicone additive (i.e., materials do not contain an Si atom), which preferably comprises a strongly polar and/or hydrogen-bonding head group, further enhances soil removal by the compositions of the present invention. Examples of the strongly polar and/or hydrogen-bonding head group-containing materials include, but are not limited to alcohols, cationic materials such as cationic surfactants, quaternary surfactants, quaternary ammonium salts such as ammonium chlorides (nonlimiting examples of ammonium chlorides are Arquad materials commercially available from Akzo Nobel) and cationic fabric softening actives, nonionic materials such as nonionic surfactants (i.e., alcohol ethoxylates, polyhydroxy fatty acid amides), gemini surfactants, anionic surfactants, zwitterionic surfactants, carboxylic acids, sulfates, sulphonates, phosphates, phosphonates, and nitrogen containing materials. In one embodiment, non-silicone additives comprise nitrogen containing materials selected from the group consisting of primary, secondary and tertiary amines, diamines, triamines, ethoxylated amines, amine oxides, amides and betaines, a nonlimiting example of a betaines is Schercotaine materials commercially available from Scher Chemicals and mixtures thereof. In another embodiment, alkyl chain contains branching that may help lower the melting point. In yet another embodiment, primary alkylamines comprising from about 6 to about 22 carbon atoms are used. Particularly preferred primary alkylamines are oleylamine (commercially available from Akzo under the trade name Armeen® OLD), dodecylamine (commercially available from Akzo under the trade name Armeen® 12D), branched C16-C22 alkylamine (commercially available from Rohm & Haas under the trade name Primene® JM-T) and mixtures thereof. Suitable cationic materials may include quaternary surfactants, which maybe quaternary ammonium compounds. Commercially available agents include Varisoft materials from Goldschmidt. where each R is a methyl or ethyl group and preferably each R1 is in the range of C15 to C19. (3) The DEQA actives described hereinabove also include the neutralized amine softening actives wherein at least one R group is a hydrogen atom. A non-limiting example of actives of this type is the chloride salt of (unsaturated alkoyloxyethyl)(unsaturated alkylamidotrimethylene)methylamine. Other examples of suitable amine softening actives are disclosed in PCT application WO 99/06509, K. A. Grimm, D. R. Bacon, T. Trinh, E. H. Wahl, and H. B. Tordil, published on Feb. 11, 1999, said application being incorporated herein by reference. wherein R1 is derived from oleic acid is available from Witco Company. Examples of Compound (5) are dialkylenedimethylammonium salts such as dicanoladimethylammonium chloride, dicanoladimethylammonium methylsulfate, di(partially hydrogenated soybean, cis/trans ratio of about 4:1) dimethylammonium chloride, dioleyldimethylammonium chloride. Dioleyldimethylammonium chloride and di(canola)dimethylammonium chloride are preferred. An example of commercially available dialkylenedimethylammonium salts usable in the present invention is dioleyldimethylammonium chloride available from Witco Corporation under the trade name Adogen® 472. An example of Compound (6) is 1-methyl-1-oleylamidoethyl-2-oleylimidazolinium methylsulfate wherein R1 is an acyclic aliphatic C15-C17 hydrocarbon group, R2 is an ethylene group, G is a NH group, R5 is a methyl group and A− is a methyl sulfate anion, available commercially from the Witco Corporation under the trade name Varisoft® 3690. 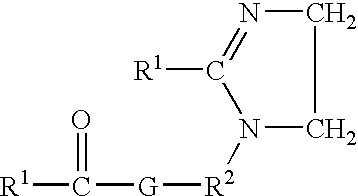 An example of Compound (7) is 1-oleylamidoethyl-2-oleylimidazoline wherein R1 is an acyclic aliphatic C15-C17 hydrocarbon group, R2 is an ethylene group, and G is a NH group. wherein R1—C(O) is oleoyl group of a commercially available oleic acid derived from a vegetable or animal source, such as Emersol® 223LL or Emersol® 7021, available from Henkel Corporation, and R2 and R3 are divalent ethylene groups. wherein R1—C(O) is oleoyl group, available commercially from the Witco Corporation under the trade name Varisoft® 222LT. wherein R1—C(O) is oleoyl group of a commercially available oleic acid derived from a vegetable or animal source, such as Emersol® 223LL or Emersol® 7021, available from Henkel Corporation. The above individual Compounds (actives) can be used individually or as mixtures. Examples of Compound (12) are the monoalkenyltrimethylammonium salts such as monooleyltrimethylammonium chloride, monocanolatrimethylammonium chloride, and soyatrimethylammonium chloride. Monooleyltrimethylammonium chloride and monocanolatrimethylammonium chloride are preferred. 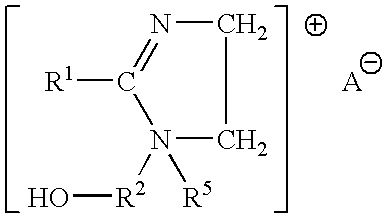 Other examples of Compound (12) are soyatrimethylammonium chloride available from Witco Corporation under the trade name Adogen® 415, erucyltrimethylammonium chloride wherein R1 is a C22 hydrocarbon group derived from a natural source; soyadimethylethylammonium ethylsulfate wherein R1 is a C16-C18 hydrocarbon group, R5 is a methyl group, R6 is an ethyl group, and A− is an ethylsulfate anion; and methyl bis(2-hydroxyethyl)oleylammonium chloride wherein R1 is a C18 hydrocarbon group, R5 is a 2-hydroxyethyl group and R6 is a methyl group. An example of Compound (14) is 1-ethyl-1-(2-hydroxyethyl)-2-isoheptadecylimidazolinium ethylsulfate wherein R1 is a C17 hydrocarbon group, R2 is an ethylene group, R5 is an ethyl group, and A− is an ethylsulfate anion. available from Witco Corporation under the trade name Adogen® 477. In the cationic nitrogenous salts herein, the anion A−, which is any softening active compatible anion, provides electrical neutrality. Most often, the anion used to provide electrical neutrality in these salts is from a strong acid, especially a halide, such as chloride, methylsulfate, bromide, or iodide. However, other anions can be used, such as ethylsulfate, acetate, formate, sulfate, carbonate, and the like. Chloride and methylsulfate are preferred herein as anion A.
wherein each R′ and R″ is independently selected from the group consisting of 12-30 C atoms or derived from tallow, coconut oil or soy, X=Cl or Br, Nonlimiting examples include: didodecyldimethylammonium bromide (DDAB), dihexadecyldimethyl ammonium chloride, dihexadecyldimethyl ammonium bromide, dioctadecyldimethyl ammonium chloride, dieicosyldimethyl ammonium chloride, didocosyldimethyl ammonium chloride, dicoconutdimethyl ammonium chloride, ditallowedimethyl ammonium bromide (DTAB). Commercially available examples include, but are not limited to: ADOGEN, ARQUAD, TOMAH, VARIQUAT. 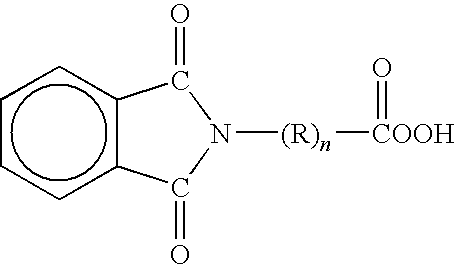 wherein R1 is C8-C16 alkyl, each of R2, R3 and R4 is independently C1-C4 alkyl, C1-C4 hydroxy alkyl, benzyl, and —(C2H4O)xH where x has a value from 2 to 5, and X is an anion. Not more than one of R2, R3 or R4 should be benzyl. b) fatty alcohol ethoxylates, R—(OCH2CH2)aOH a=1 to 100, typically 12-40, R=hydrocarbon residue 8 to 20 C atoms, typically linear alkyl. Examples polyoxyethylene lauryl ether, with 4 or 23 oxyethylene groups; polyoxyethylene cetyl ether with 2, 10 or 20 oxyethylene groups; polyoxyethylene stearyl ether, with 2, 10, 20, 21 or 100 oxyethylene groups; polyoxyethylene (2), (10) oleyl ether, with 2 or 10 oxyethylene groups. Commercially available examples include, but are not limited to: ALFONIC, BRIJ, GENAPOL, NEODOL, SURFONIC, TRYCOL. wherein R8 is an alkyl group or an alkyl aryl group, selected from the group consisting of primary, secondary and branched chain alkyl hydrocarbyl groups, primary, secondary and branched chain alkenyl hydrocarbyl groups, and/or primary, secondary and branched chain alkyl- and alkenyl-substituted phenolic hydrocarbyl groups having from about 6 to about 20 carbon atoms, preferably from about 8 to about 18, more preferably from about 10 to about 15 carbon atoms; s is an integer from about 2 to about 45, preferably from about 2 to about 20, more preferably from about 2 to about 15; B is a hydrogen, a carboxylate group, or a sulfate group; and linking group Z is —O—, —C(O)O—, —C(O)N(R)—, or —C(O)N(R)—, and mixtures thereof, in which R, when present, is R8 or hydrogen. The nonionic surfactants herein are characterized by an HLB (hydrophilic-lipophilic balance) of from 5 to 20, preferably from 6 to 15.
branched chain alcohol ethoxylates, wherein branched chain primary and secondary alcohols (or Guerbet alcohols) which are available, e.g., from the well-known “OXO” process or modification thereof are ethoxylated. Especially preferred are alkyl ethoxylate surfactants with each R8 being C8-C16 straight chain and/or branch chain alkyl and the number of ethyleneoxy groups s being from about 2 to about 6, preferably from about 2 to about 4, more preferably with R8 being C8-C15 alkyl and s being from about 2.25 to about 3.5. These nonionic surfactants are characterized by an HLB of from 6 to about 11, preferably from about 6.5 to about 9.5, and more preferably from about 7 to about 9. Nonlimiting examples of commercially available preferred surfactants are Neodol® 91-2.5 (C9-C10, s=2.7, HLB=8.5), Neodol® 23-3 (C12-C13, s=2.9, HLB=7.9) and Neodol® 25-3 (C12-C15, s=2.8, HLB=7.5. Further nonlimiting examples include nonionic surfactants selected from the group consisting of fatty acid (C12-18) esters of ethoxylated (EO5-100) sorbitans. More preferably said surfactant is selected from the group consisting of mixtures of laurate esters of sorbitol and sorbitol anhydrides; mixtures of stearate esters of sorbitol and sorbitol anhydrides; and mixtures of oleate esters of sorbitol and sorbitol anhydrides. Even more preferably said surfactant is selected from the group consisting of Polysorbate 20, which is a mixture of laurate esters of sorbitol and sorbitol anhydrides consisting predominantly of the monoester, condensed with about 20 moles of ethylene oxide; Polysorbate 60 which is a mixture of stearate esters of sorbitol and sorbitol anhydride, consisting predominantly of the monoester, condensed with about 20 moles of ethylene oxide; Polysorbate 80 which is a mixture of oleate esters of sorbitol and sorbitol anhydrides, consisting predominantly of the monoester, condensed with about 20 moles of ethylene oxide; and mixtures thereof. Most preferably, said surfactant is Polysorbate 60. In one embodiment, the anionic surfactants include alkyl alkoxylated sulfate surfactants hereof are water soluble salts or acids of the formula RO(A)mSO3M wherein R is an unsubstituted C10-C24 alkyl or hydroxyalkyl group having a C10-C24 alkyl component, preferably a C12-C20 alkyl or hydroxyalkyl, more preferably C12-C18 alkyl or hydroxyalkyl, A is an ethoxy or propoxy unit, m is greater than zero, typically between about 0.5 and about 6, more preferably between about 0.5 and about 3, and M is H or a cation which can be, for example, a metal cation (e.g., sodium, potassium, lithium, calcium, magnesium, etc. ), ammonium or substituted-ammonium cation. Alkyl ethoxylated sulfates as well as alkyl propoxylated sulfates are contemplated herein. The non-silicone additive, when present in the fabric article treating compositions of the present invention, preferably comprises from about 0.01% to about 10%, more preferably from about 0.02% to about 5%, even more preferably from about 0.05% to about 2% by weight of the fabric article treating composition. 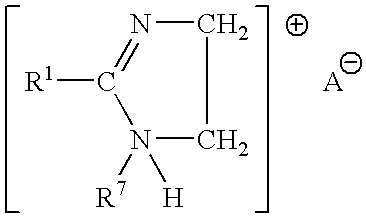 The non-silicone additive, when present in the consumable detergent compositions of the present invention, preferably comprises from about 1% to about 90%, more preferably from about 2% to about 75%, even more preferably from about 5% to about 60% by weight of the consumable detergent composition. In one embodiment, the surfactant component comprises a non-silicone additive. In another embodiment, the surfactant component does not comprise a non-silicone additive. Compositions according to the present invention may further comprise a polar solvent. Non-limiting examples of polar solvents include: water, alcohols, glycols, polyglycols, ethers, carbonates, dibasic esters, ketones, other oxygenated solvents, and mixtures thereof. Further examples of alcohols include: C1-C126 alcohols, such as propanol, ethanol, isopropyl alcohol, etc. . . . , benzyl alcohol, and diols such as 1,2-hexanediol. The Dowanol® series by Dow Chemical are examples of glycols and polyglycols useful in the present invention, such as Dowanol® TPM, TPnP, DPnB, DPnP, TPnB, PPh, DPM, DPMA, DB, and others. Further examples include propylene glycol, butylene glycol, polybutylene glycol and more hydrophobic glycols. Examples of carbonate solvents are ethylene, propylene and butylene carbonantes such as those available under the Jeffsol® tradename. Polar solvents for the present invention can be further identified through their dispersive (δD), polar (δP) and hydrogen bonding (δH) Hansen solubility parameters. Preferred polar solvents or polar solvent mixtures have fractional polar (fP) and fractional hydrogen bonding (fH) values of fP>0.02 and fH>0.10, where fP=δp/(δD+δPδH) and fH=δH/(δD+δP+δH), more preferably fP>0.05 and fH>0.20, and most preferably fP>0.07 and fH>0.30. In the detergent composition of the present invention, the levels of polar solvent can be from about 0 to about 70%, preferably 1 to 50%, even more preferably 1 to 30% by weight of the detergent composition. Water, when present in the wash fluid fabric article treating compositions of the present invention, the wash fluid composition may comprise from about 0.001% to about 10%, more preferably from about 0.005% to about 5%, even more preferably from about 0.01% to about 1% by weight of the wash fluid fabric article treating composition. Water, when present in the detergent compositions of the present invention, preferably comprises from about 1% to about 90%, more preferably from about 2% to about 75%, even more preferably from about 5% to about 40% by weight of the consumable detergent composition. Optionally, the compositions of the present invention may further comprise processing aids. Processing aids facilitate the formation of the fabric article treating compositions of the present invention, by maintaining the fluidity and/or homogeneity of the consumable detergent composition, and/or aiding in the dilution process. Processing aids suitable for the present invention are solvents, preferably solvents other than those described above, hydrotropes, and/or surfactants, preferably surfactants other than those described above with respect to the surfactant component. Particularly preferred processing aids are protic solvents such as aliphatic alcohols, diols, triols, etc. and nonionic surfactants such as ethoxylated fatty alcohols. Processing aids, when present in the fabric article treating compositions of the present invention, preferably comprise from about 0.02% to about 10%, more preferably from about 0.05% to about 10%, even more preferably from about 0.1% to about 10% by weight of the fabric article treating composition. Processing aids, when present in the consumable detergent compositions of the present invention, preferably comprise from about 1% to about 75%, more preferably from about 5% to about 50% by weight of the consumable detergent composition. The compositions of the present invention may optionally further comprise one or more cleaning adjuncts. The optional cleaning adjuncts can vary widely and can be used at widely ranging levels. For example, detersive enzymes such as proteases, amylases, cellulases, lipases and the like as well as bleach catalysts including the macrocyclic types having manganese or similar transition metals all useful in laundry and cleaning products can be used herein at very low, or less commonly, higher levels. Cleaning adjuncts that are catalytic, for example enzymes, can be used in “forward” or “reverse” modes, a discovery independently useful from the fabric treating methods of the present invention. For example, a lipolase or other hydrolase may be used, optionally in the presence of alcohols as cleaning adjuncts, to convert fatty acids to esters, thereby increasing their solubility in the lipophilic fluid. This is a “reverse” operation, in contrast with the normal use of this hydrolase in water to convert a less water-soluble fatty ester to a more water-soluble material. In any event, any cleaning adjunct must be suitable for use in combination with a lipophilic fluid in accordance with the present invention. Some suitable cleaning adjuncts include, but are not limited to, builders, surfactants, other than those described above with respect to the surfactant component, enzymes, bleach activators, bleach catalysts, bleach boosters, bleaches, alkalinity sources, antibacterial agents, colorants, perfumes, pro-perfumes, finishing aids, lime soap dispersants, odor control agents, odor neutralizers, polymeric dye transfer inhibiting agents, crystal growth inhibitors, photobleaches, heavy metal ion sequestrants, anti-tarnishing agents, anti-microbial agents, anti-oxidants, anti-redeposition agents, soil release polymers, electrolytes, pH modifiers, thickeners, abrasives, divalent or trivalent ions, metal ion salts, enzyme stabilizers, corrosion inhibitors, polyamines and/or their alkoxylates, suds stabilizing polymers, solvents, process aids, fabric softening agents, optical brighteners, hydrotropes, suds or foam suppressors, suds or foam boosters and mixtures thereof. Suitable odor control agents, which may optionally be used as finishing agents, include agents include, cyclodextrins, odor neutralizers, odor blockers and mixtures thereof. Suitable odor neutralizers include aldehydes, flavanoids, metallic salts, water-soluble polymers, zeolites, activated carbon and mixtures thereof. Perfumes and perfumery ingredients useful in the compositions of the present invention comprise a wide variety of natural and synthetic chemical ingredients, including, but not limited to, aldehydes, ketones, esters, and the like. Also included are various natural extracts and essences which can comprise complex mixtures of ingredients, such as orange oil, lemon oil, rose extract, lavender, musk, patchouli, balsamic essence, sandalwood oil, pine oil, cedar, and the like. Finished perfumes may comprise extremely complex mixtures of such ingredients. Pro-perfumes are also useful in the present invention. Such materials are those precursors or mixtures thereof capable of chemically reacting, e.g., by hydrolysis, to release a perfume, and are described in patents and/or published patent applications to Procter and Gamble, Firmenich, Givaudan and others. Bleaches, especially oxygen bleaches, are another type of cleaning adjunct suitable for use in the compositions of the present invention. This is especially the case for the activated and catalyzed forms with such bleach activators as nonanoyloxybenzenesulfonate and/or any of its linear or branched higher or lower homologs, and/or tetraacetylethylenediamine and/or any of its derivatives or derivatives of phthaloylimidoperoxycaproic acid (PAP) or other imido- or amido-substituted bleach activators including the lactam types, or more generally any mixture of hydrophilic and/or hydrophobic bleach activators (especially acyl derivatives including those of the C6-C16 substituted oxybenzenesulfonates). wherein R is C1-4 alkyl and n is an integer of from 1 to 5. A particularly preferred peracid has the formula where R is CH2 and n is 5 i.e., phthaloylamino peroxy caproic acid (PAP) as described in U.S. Pat. Nos. 5,487,818, 5,310,934, 5,246,620, 5,279,757 and 5,132,431. PAP is available from Ausimont SpA under the tradename Euroco®. Other cleaning adjuncts suitable for use in the compositions of the present invention include, but are not limited to, builders including the insoluble types such as zeolites including zeolites A, P and the so-called maximum aluminum P as well as the soluble types such as the phosphates and polyphosphates, any of the hydrous, water-soluble or water-insoluble silicates, 2,2′-oxydisuccinates, tartrate succinates, glycolates, NTA and many other ethercarboxylates or citrates; chelants including EDTA, S,S′-EDDS, DTPA and phosphonates; water-soluble polymers, copolymers and terpolymers; soil release polymers; optical brighteners; processing aids such as crisping agents and/fillers; anti-redeposition agents; hydrotropes, such as sodium, or calcium cumene sulfonate, potassium napthalenesulfonate, or the like, humectant; other perfumes or pro-perfumes; dyes; photobleaches; thickeners; simple salts; alkalis such as those based on sodium or potassium including the hydroxides, carbonates, bicarbonates and sulfates and the like; and combinations of one or more of these cleaning adjuncts. The cleaning adjunct may also be an antistatic agent. Any suitable well-known antistatic agents used in conventional laundering and dry cleaning are suitable for use in the compositions and methods of the present invention. Especially suitable as antistatic agents are the subset of fabric softeners which are known to provide antistatic benefits. For example those fabric softeners that have a fatty acyl group which has an iodine value of above 20, such as N,N-di(tallowoyl-oxy-ethyl)-N,N-dimethyl ammonium methylsulfate. However, it is to be understood that the term antistatic agent is not to be limited to just this subset of fabric softeners and includes all antistatic agents. Preferred insect and moth repellent cleaning adjuncts useful in the compositions of the present invention are perfume ingredients, such as citronellol, citronellal, citral, linalool, cedar extract, geranium oil, sandalwood oil, 2-(diethylphenoxy)ethanol, 1-dodecene, etc. Other examples of insect and/or moth repellents useful in the compositions of the present invention are disclosed in U.S. Pat. Nos. 4,449,987; 4,693,890; 4,696,676; 4,933,371; 5,030,660; 5,196,200; and in “Semio Activity of Flavor and Fragrance Molecules on Various Insect Species”, B. D. Mookherjee et al., published in Bioactive Volatile Compounds from Plants, ACS Symposium Series 525, R. Teranishi, R. G. Buttery, and H. Sugisawa, 1993, pp. 35-48, all of said patents and publications being incorporated herein by reference. The following are non-limiting examples of fabric article treating compositions in accordance with the present invention. A fabric article that has been treated in accordance a method of the present invention is also within the scope of the present invention. Preferably such a treated fabric article comprises an analytically detectable amount of at least one compound (e.g., an organosilicone) having a surface energy modifying effect but no antistatic effect; or an analytically detectable amount of at least one compound having a surface energy modifying and/or feel-modifying and/or comfort-modifying and/or aesthetic effect and at least one antistatic agent other than said at least one compound. c) from about 2% to about 40% by weight of the composition of a polar solvent comprising propylene glycol, propylene glycol ethers, or mixtures thereof. wherein R8 is an alkyl group or an alkyl aryl group, selected from the group consisting of primary, secondary and branched chain alkyl hydrocarbyl groups, primary, secondary and branched chain alkenyl hydrocarbyl groups, and/or primary, secondary and branched chain alkyl- and alkenyl-substituted phenolic hydrocarbyl groups having from about 6 to about 20 carbon atoms; s is an integer from about 2 to about 45; B is a hydrogen, a carboxylate group, or a sulfate group; and linking group Z is —O—, —C(O)O—, —C(O)N(R)—, or —C(O)N(R)—, and mixtures thereof, in which R, when present, is R8 or hydrogen. 3. The consumable detergent composition according to claim 2 wherein the nonionic surfactant comprises a secondary alcohol ethoxylate, with R8 being C8-C18 alkyl and/or alkenyl group, and s being from about 2 to about 8. 4. The consumable detergent composition according to claim 2 wherein the nonionic surfactant comprises an alkyl ethoxylate, with R8 being C8-C16 straight or branched chain alkyl and/or alkenyl group, and s being from about 2 to about 6. 5. The consumable detergent composition according to claim 2 wherein the nonionic surfactant comprises an alkyl ethoxylate, with R8 being C8-C15 alkyl group, and s being from about 2.25 to about 3.5. 6. The consumable detergent composition according to claim 2 wherein the nonionic surfactant has an HLB of from about 6 to about 11. G is an anion or cation such as H+, Na+, Li+, K+, NH4 +, Ca+2, Me+2, Cl−, Br−, I−, mesylate or tosylate. 8. The consumable detergent composition according to claim 1 further comprising from about 1% to about 60% by weight of the composition of a non-silicone additive selected from the group consisting of anionic, cationic, zwitterionic surfactants and mixtures thereof. 9. The consumable composition of claim 1, wherein the polar solvent further comprises water. 10. The fabric article treating composition according to claim 1 wherein said composition further comprises a cleaning adjunct selected from the group consisting of: builders, additional surfactants, emulsifying agents, enzymes, bleach activators, bleach catalysts, bleach boosters, bleaches, alkalinity sources, antibacterial agent, colorants, perfume, lime soap dispersants, odor control agents, odor neutralizers, polymeric dye transfer inhibiting agents, crystal growth inhibitors, photobleaches, heavy metal ion sequestrants, anti-tarnishing agents, anti-microbial agents, anti-oxidants, anti-redeposition agents, soil release polymers, electrolytes, pH modifiers, thickeners, abrasives, divalent ions, metal ion salts, enzyme stabilizers, corrosion inhibitors, diamines, suds stabilizing polymers, solvents, process aids, fabric softening agents or actives, sizing agents, optical brighteners, hydrotropes and mixtures thereof. wherein R8 is an alkyl group or an alkyl aryl group, selected from the group consisting of primary, secondary and branched chain alkyl hydrocarbyl groups, primary, secondary and branched chain alkenyl hydrocarbyl groups, and/or primary, secondary and branched chain alkyl- and alkenyl-substituted phenolic hydrocarbyl groups having from about 6 to about 20 carbon atoms; s is an integer from about 2 to about 45; B is a hydrogen, a carboxylate group, or a sulfate group; and linking group Z is —O—, —C(O)O, —C(O)N(R)—, or —C(O)N(R)—, and mixtures thereof, in which R, when present, is R8 or hydrogen. 13. The fabric article treating composition according to claim 12 wherein the nonionic surfactant comprises a secondary alcohol ethoxylate, with R8 being C8-C18 alkyl and/or alkenyl group, and s being from about 2 to about 8. 14. The fabric article treating composition according to claim 12 wherein the nonionic surfactant comprises an alkyl ethoxylate, with R8 being C8-C16 straight or branched chain alkyl and/or alkenyl group, and s being from about 2 to about 6. 15. The fabric article treating composition according to claim 12 wherein the nonionic surfactant comprises an alkyl ethoxylate, with R8 being C8-C15 alkyl group, and s being from about 2.25 to about 3.5. G is an anion or cation such as H+, Na+, Li+, K+, NH4 +, Ca+2, Mg+2, Cl−, Br−, I−, mesylate or tosylate. 18. A method for preparation of a fabric article treating composition from a consumable detergent composition comprising the step of mixing a consumable detergent composition according to claim 1 with decamethylcyclopentasiloxane to form the fabric article treating composition. b) contacting the fabric articles with the fabric article treating composition from step a), such that the fabric articles are treated. 20. A method for laundering fabric articles in need of treatment comprising the step of contacting the fabric articles with a consumable detergent composition according to claim 1 in the presence of decamethylcyclopentasiloxane. wherein steps a) and b) can occur in any sequence and/or concurrently. ES2332003T3 (en) * 2004-02-17 2010-01-22 Optimer, Inc. Compositions useful as fabric softeners. FI72998C (en) 1987-08-10 Hoegverkande vaetskeformigt tvaettmedel som goer textilerna mjuka samt foerfarande Foer Dess framstaellning. FI73731B (en) 1987-07-31 Tygrengoeringsmedel som laempar sig Foer lerbaseradeflaeckar.